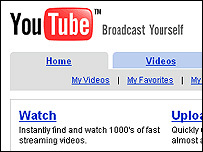 Within 15 months, Youtube.com has become one of the internet's most watched websites, with 25 million hits a day. It is entertaining, addictive and viral. Many more video sites popping up, some even offering cash for contributions. "From the get-go we've been big believers in the democratisation of original user-created content", says Keith Richman from video site Break.com. "When we began the company we recognised that a new era was coming where broadband was proliferating so people were going to be able to access higher quality video content, where technology was enabling the tools to create content to become cheaper and more accessible. "We saw that all the confluence of trends were going to lead to a new generation of content creators." On Break.com the best videos are voted to the top. But it is not all silly stunts and goofy clips; some of this stuff is pretty serious. Video flooded in from every corner of America to Getdemocracy.com during the recent US immigration day strike. Cheap video cameras and convenient online storage along with broadband make this possible. David Moore, from Getdemocracy.com, says: "I think what's happening is that there's a genuine movement where TV and video is shifting from a top-down medium, to a medium that's entirely from the bottom up, where everyone is able to, say, create a local news channel, or to publish video of their family reunion online easily. "And more and more people are watching this kind of video online and taking their eyes away from the TV screen and moving towards the computer screen." The website provides free editing and uploading tools. Even the player is built on open source code. Traditional video players have largely been replaced by Flash, because of its flexibility and huge install base. Keith Richman says: "The technologies surrounding video syndication have really evolved, even in the last six months. "What we're seeing now, along with the player itself, is the ability to embed advertising very simply, to embed marketing and creative associated with the video, and to embed copyright protection that you couldn't have done before." Traditional media outlets are unsure what to do, especially regarding the copyright issue. Movie companies are afraid their films will end up online, yet TV shows benefit from priceless promotional opportunities. The power of the medium is undeniable. Computer users are now just a click away from instant entertainment 24/7. Of course that is not always a good thing. Lance Ulanoff, from PC Magazine, says: "It's a big time waster. People are sucked in. I like to call them iVideots. I'm an iVideot, it's iVideoism. "I think it exists and I think it's becoming a real problem for companies where they're finding employees just watching videos. "They can't help themselves, they get a link, they watch it, then they watch another. Youtube is like popcorn, you just keep going through them." Social networking websites like MySpace.com have fuelled the viral intensity of web videos. Marketers and advertisers are not far behind, using these sites to their advantage, but DIY video is a double-edged sword. One car company recently invited visitors to create their own commercial from the supplied clips and fonts. The idea quickly caught the attention of environmentalists who created their own advertising campaign. But despite the setbacks, everyone in the industry says online video 2.0 is here to stay and it is only a matter of time before a new tier of home-based entertainers become household names around the world.